‘Modern Life is Rubbish’ Blur proclaimed with their second album’s name, playing on the ever present desire to harken back to the good old days when everything seemed better- the economy stronger, the parties wilder and the entertainment more thrilling than anything around today. Nostalgia still reigns supreme and rarely is the ideal of a better time more apparent than in Rush, the 1970s golden era of Formula One racing. Fatal crashes were far from isolated incidents making the drivers true icons of the time, racing dangerously close to the fine lines of life and death for a chance at glory in the form of trophies, women and a place in the annals of sporting history. At the heart of sport’s most memorable moments are enthralling rivalries that grab the imaginations of the adoring crowds and the 1976 Formula One championships heralded one of the racing’s most thrilling duels that forms the backbone of Rush. In one car was the Englishman James Hunt (Chris Hemsworth), a charming and handsome figure with his flowing blonde hair and dry sense of humour that made him a people’s champion despite his reckless driving style and reputation as a heavy drinker, party animal and ladies’ man- essentially the George Best of the racing world. If Hunt was Best then his rival, Austrian Niki Lauda (Daniel Brühl), would have been the 1971, 1973 and 1974 player of year Johan Cruyff- deadly serious, calculating, efficient and obsessed with winning on the track, not in the popularity polls. While Best and Cruyff rarely clashed directly on the pitch in the 70s, Hunt and Lauda were neck and neck from their humble beginnings in Formula Three all the way to the dizzying heights of world championships in Brazil and Japan. Rush couldn’t have found a better rivalry to be its centrepiece- two drivers at the peak of their game with vastly opposing styles, on and off the track, who despised each other as much as they respected their skills behind the wheel. As with all great sporting films the focus isn’t actually on the sport but on those who populate it-the champions, losers, heroes and villains- Rush is no different. The real test of a sport film’s success is in whether someone who has no interest in the sport can enjoy the feature, undoubtedly Rush will keep even the most ignorant Formula One fan following every twist and turn on the deadly Nordschleife track. Rush’s star man has been billed as the unnervingly handsome Chris Hemsworth, probably due to his looks more than anything, but it’s the relative unknown Daniel Brühl who is the standout performer. Brühl is brilliant throughout as the enigmatic thinker Lauda, being both much more interesting than Hunt as well as likeable. Much of Brühl’s success in his role is down to the bigger part and meaty material provided by director Ron Howard allowing the character of Lauda to be explored fully, in contrast Hemsworth isn’t given the opportunity to delve into Hunt’s life, and most intriguingly his vices. Saying this Hemsworth looks and plays the part of the cocksure, pompous driver with assurance, it’s just a shame that he can’t explore the person behind the façade of arrogance. 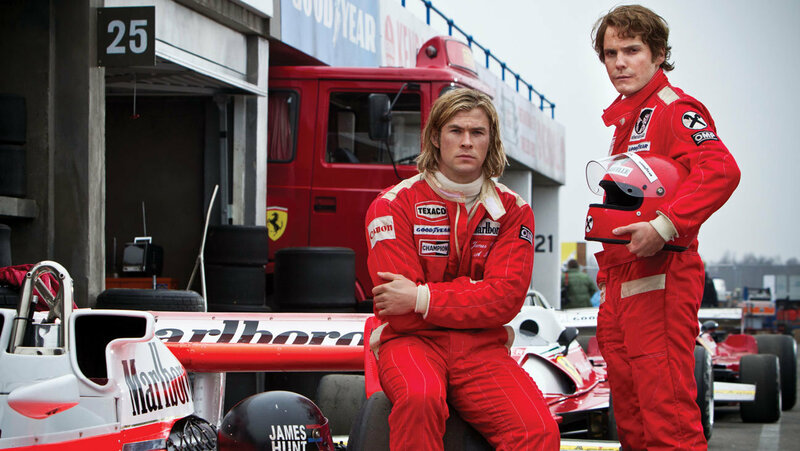 Rather than being a sporting biopic of either Lauda or Hunt, or both, Rush is a dramatisation of a specific moment in Formula One, luckily the moment, the 1976 championships, was brimming with excitement and drama. Howard allows a comprehensive look into both drivers’ lives, simplifying them down to emphasise their contrasting personalities without delving into the depths of a full on biopic. You could argue that Rush never gets to the bottom of the complexities of Lauda and Hunt, most definitely in his case, but for the film that Howard sets out to show he gets it perfectly right. It’s the drama of life threatening racing between two great rivals where the film’s brilliance lies, a full biography of either driver isn’t the aim, the sporting moment of one championship season is the star with the rival racers merely part of it. The pageantry of era coupled with the grainy, almost documentary style of filming give Rush a level of authenticity we have come to expect due to recent impressive period pieces like Argo. The story is superbly told mixing credibility with a likely sprinkling of embellishment to create a film worthy tale that holds interest through compelling characters and pulsating racing sequences. One time Happy Day-er Ron Howard has directed a wonderful sporting biopic that gathers everything best about the genre to produce something with more power and excitement than Niki Lauda’s blood red Ferrari. 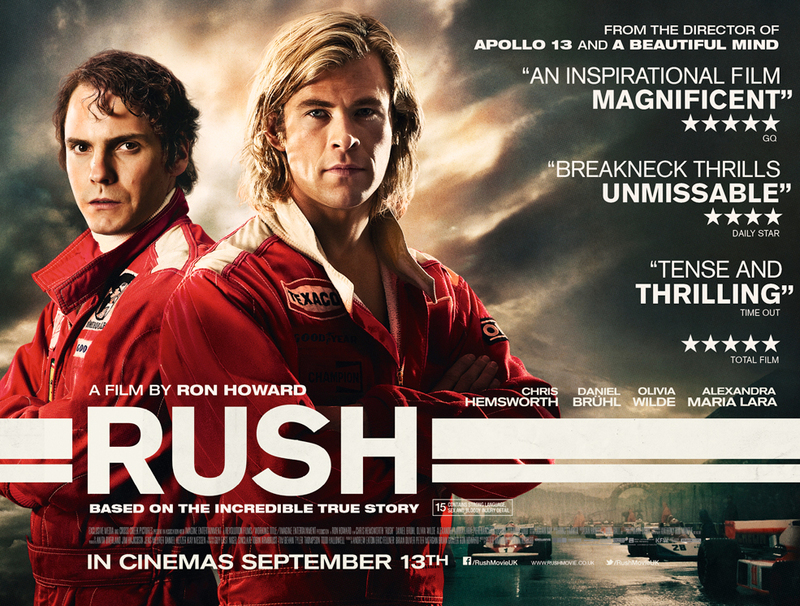 Nearly impeccable in its direction, production and approach, Rush is a fantastic outing and a fine addition to the sporting genre.